Could these be your salad days? I know they’re mine. 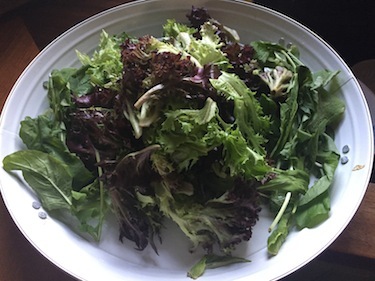 Spring always delivers sweet, tender greens perfect for salad – Oak Leaf, Black Seeded Simpson, Deer Tongue, Bibb, Cos, Green Leaf, and Buttercrunch. Bitter Arugula, Kale, Frisée, and spicy micro mixes widen the flavor field. Toppings abound in green onions, radishes, salad turnips, broccoli, cauliflower, carrots, and fresh herbs. Mix, match, and combine your favorites…yum! It’s not unusual for me to serve a salad as part of a family meal, but when it’s just me I have to be a little more crafty. I may not want to take the time to clean and chop a salad for one. My way around that reluctance is to create a basic salad mix and store it in the fridge. At meal time, I can grab a handful to throw on my plate or I can add ingredients to create a specific flavor profile or entree salad. I currently have a salad made of red and green spring mix, chopped green onions, and carrots stored in a Glad® Ovenware 9 x 12 pan in the refrigerator. These pans work great for this purpose. They’re rectangular, not too tall, and easy to stack. I can fill a second container with a salad of arugula or spinach and store it on top of the existing one. For dinner yesterday, I topped a large bowl of this salad base with tuna salad and almonds. It was crunchy, satisfying, and ready in 5 minutes. Having something green I can quickly prepare helps keep me on track when I fill my schedule too full. When it’s just as easy to reach for the salad as it is to reach for something less healthy, I’m more likely to reach for the salad. I’ve also discovered that salad is appreciated when family and friends gather for the birth of a baby, a health crisis, or the loss of a loved one. 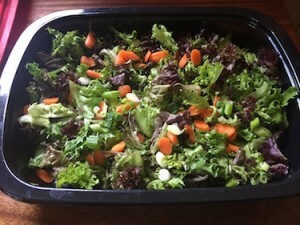 Last year when DJ was born, I mixed a variety of salads each week and delivered them to Ben & his wife. It was easy for me and a great addition to all the casserole dinners their friends delivered. Every time I offered assistance in those early days of baby fatigue, Ben asked for more salad. Leafy greens don’t just provide a filling crunch, they’re packed with vitamins like A, C, K, and folate plus minerals like potassium and calcium. Delivering all this nutrition with a maximum of fiber and a minimum of calories makes leafy greens a great food choice. Of course, it’s easy to make them less healthy by overdressing or over adorning a salad. 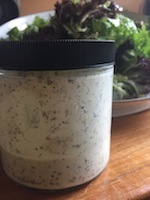 I like to make salad dressing just before serving the salad and I usually serve it on the side. Yogurt or olive oil make a good base for homemade dressings, and flavored balsamic vinegar, fresh squeezed juice, or unsweetened fruit juice can add interesting flavors. Here’s a vinaigrette I often pair with arugula. Just mix it all up and let it sit for a few minutes before dressing the salad. Some of my favorite salad toppings are blueberries, strawberries, ripe pears, oven roasted pumpkin seeds, spiced pecans, raw sunflower seeds, raw almonds, raw cashews, goat cheese, bleu cheese, green peas, homegrown tomatoes, green onions, fresh basil, and fresh mint. I also appreciate black beans, avocado, red bell pepper, white cheddar, and crispy bacon. However you mix it, top it, flavor it, and dress it, having a basic salad prepared is sure to increase your consumption of leafy green vegetables. That can’t be a bad thing. And all the fresh, tender greens make spring my favorite time of year for salad days!